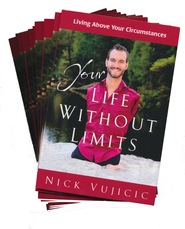 Your Life Without Limits is a compellingly honest booklet by Nick Vujicic in which he talks about his life without limbs... and limits. Vujicic, a South African young man, was born without arms or legs. In this booklet he shares a brief account of his struggles and the freedom he found in Christ. When I reflected on this booklet for the review, the word that kept coming to my head was the one I used before: honest. Vujicic talks transparently about his former depression and despair, as well as the One who lifted him out. I felt Vujicic's sincerity and appreciated the openness with which he shared his struggles with his differences... and smiled as he found Jesus transcends such differences. I believe this is a lovely little booklet and would share it. I received this book for free from Waterbrook Multnomah in exchange for my unbiased review.